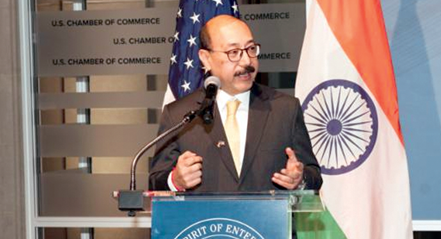 US-India Business Council Hosts Reception in Honor of Shringla, Indian Ambassador to U.S.
Washington DC: On 15 January 2019, the United States-India Business Council (USIBC) hosted a welcome reception in honour of Shri Harsh Vardhan Shringla, Ambassador of India to the United States. Congressmen, senior US government officials, representatives of U.S. companies, industry associations and a cross-section of the media were present at the event. Ambassador Shringla also held a meeting with Thomas J. Donohue, CEO and President of U.S. Chamber of Commerce, along with Nisha Biswal, President of the USIBC. One Response to US-India Business Council Hosts Reception in Honor of Shringla, Indian Ambassador to U.S.